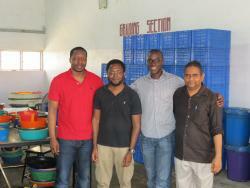 The ACA recently saw its mission realized by a new team of cashew processing companies. In late June 2013, the Food Processing Co. Ltd. (Food Pro) was in the process of implementing the ACA Quality and Sustainability Seal program at their plant in Nigeria. In order to better understand the necessary elements of an efficient and quality factory, the Food Pro team hoped to tour a working and Seal approved facility. Their search led them to a man and company that had once been in their position. Cashew Alliance office in Accra with a plan to open up a cashew processing plant in his home country of Kenya. After their initial meeting, the ACA teamed up with Patrick and set up a tour for him at another ACA member’s processing plant in Cote D’Ivoire. At the Olam International processing plant, Patrick learned valuable best practices and standards for factory development. Along with this, ACA’s Sunil Dahiya provided Patrick and the rest of the Jungle Nuts team with technical assistance during factory development. Today, Jungle Nuts stands as one of the best processing plants in Africa. Additionally, Patrick has made his factory in Thika, Kenya a learning ground for other entrepreneurs, who like he once did, want to tour a running plant before developing or improving their own. He continually looks beyond the singular and exclusive growth of Jungle Nuts, in order to provide support to the promising cashe processing industry in Africa. People like Patrick transform the African Cashew Alliance into more than just members and linkages, by creating a true community in which inter-African learning thrives. The Food-Pro Group of Nigeria is just one of the benefactors of Patrick’s drive. 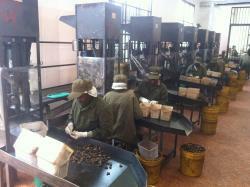 The team recently traveled to Kenya for a comprehensive tour of the Jungle Nuts Plant. For three days, the Jungle Nuts team answered questions and took Food-Pro representatives through the factory processes. At the end of the facility tour, Mr. Ayodele Olajiga of Food Pro stated “Words cannot really express our gratitude [To the Jungle Nuts Team] and we think that the only way to start to say thank you is to create a factory that [they] will be proud of as we go through the journey of upgrading our facilities."